Achilles Tendon Pain shows up for a variety of reasons. Whether you have new Achilles injury and pain, or old, chronic Achilles Tendonitis symptoms, it is useful to know what -exactly- is going on that is causing problems. Your doctor may have told you that you are suffering from Achilles Tendonitis. Maybe you are, maybe you aren't. The pain of a hurting Achilles Tendon comes from a variety of directions and consists of a variety of factors. Just because your doctor diagnoses you with achilles tendonitis' doesn't necessarily mean that's the whole story. 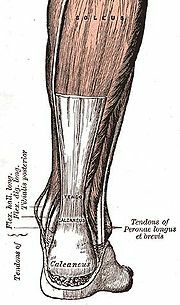 The Achilles Tendon is a big, strong structure. If you feel pain, you should pay attention and get onto an Achilles Tendon rehab routine PRONTO! If it's hurting now, it's going to hurt later. And it's better to nip it in the bud than to let it progress. If you're already past that point and have been hurting for a length of time, again, get to fixing it. The good news is, even if it's been hurting for years doesn't automatically mean that it's a complex issue. What exactly is the cause of your Achilles Tendon Pain? Achilles Tendonosis is the term for degeneration of tendon tissue due to lack of new blood and nutrition. Cells starve and die. This weakens the structural integrity of a tendon. And it goes downhill from there as cells continue to starve due to malnutrition and not enough circulation. At first there is no inflammation. Eventually, the Process of Inflammation kicks in. And it goes downhill even worse from there. If Tendonosis is allowed to continue to degenerate the tendon, eventually the tendon will literally fall apart. Whether it's an athlete sprinting or a person just out for a walk, the tendon loses structural integrity and then gets at risk for partial tear or total rupture. Achilles Tendonitis is a function of repetitive motion and/or small wear and tear injury, and/or healing from a rip or tear, and/or as a function of healing from Tendonosis. Essentially, all Tendonitis consists of a dynamic of too tight muscles and connective tissue, too much constant tension on the tendon, scar tissue laying down in a structurally weak pattern, an inflammation process, and nutrional lack. If left to its own devices, Achilles Tendonitis does not returnl back to 100%, and like all tendonitis, can hurt and limit activity for decades and a lifetime. Inflammation plays a huge role in maintaining this Pain Causing Dynamic of increasing tightness and pain. Tendinopathy is tendon pain without any actual damage. When too much tension or strain is applied to an Achilles Tendon for too long a period of time, the tendon starts to hurt. Many times people get diagnosed with Tendonitis when they really just have Tendonopathy and the pain enhancing chemicals released by the Inflammation Process. A valuable concept to understand when trying to figure out why your tendon is hurting is the distinction that you can have Achilles Tendon Pain with injury, and you can have Achilles Tendon Pain -without- any actual injury to the tendon, no rip or tear. Gluten intolerance can cause Achilles Tendinopathy. Vitamin D deficiency can can tendinopathy. So can Magnesium deficiency (see: Magnesium for Tendonitis). Achilles Tendon Pain from rupture is no joke. A complete tear is an Achilles Tendon Rupture. A partial tear is in the Torn Achilles Tendon category. Athletes can tell you all sorts of stories about being out for a run, jumping out of the blocks in a sprint, jumping for a rebound, etc, and suddenly having pain from their tendon ripping and tearing. I spoke with a man just the other day that was walking to work and *BAM* all of a sudden it felt like he got hit in the calf with a brick. He had bad Tendonosis, it turns out, and his tendon just gave way. The Achilles is designed to support an amazing amount of tension. Athletes push the bounds of what it can take, and sometime they pay the price as their structure can no longer hold itself together. Most people, including athletes to some extent, unknowingly have Tendonosis degeneration, and then they be active however they are being active, and then the weakened structure tears apart under pressure it used to be able to support, and then the body does what it does to protect you, which kicks in a long process of (usually) progressive pain. The Achilles Tendon injuries are some of the slowest Tendonitis related injuries to heal. The tendon itself doesn't get direct blood/nutrition supply. By the time you hurt, your muscles and connective tissue are already way too tight, such that every step you take puts more load on the injury than you want. It takes a lot of work to adequately open that tissue up. And it's a big tendon. If you feel pain and have injury, that means the injury is halfway sizeable. If you just have Tendonopathy, that's an entirely different thing, and be happy for that. All you have to do in that case is remove the variable that is causing the tendon to feel pain, and you're good. With injury though, you have to remove the negative variables -and- rehab the injury itself. Eccentric Heel Drops aren't bad for some things, but in my opinion, your best options to resolve Achilles tendon pain and injury are my Reversing Achilles Tendonitis ebook and for more serious cases of Achilles pain, problem, and/or pir/tear injury, The ARPwave System. Return to the top of this Achilles Tendon Pain page. Go to the Achilles Tendonitis page.